network mapping freeware for Windows Mobile smartphones, WM2002/2003/2005 phone free downloads. 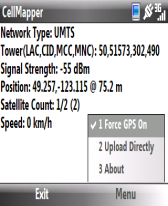 � Summary: CellMapper is a program used to map the extent of your network providers coverage and cell phone tower locations. This information helps others determine if they should use the same provider or not. It is able to run both with an without a data plan.